You don't need lots of experience with CAD. 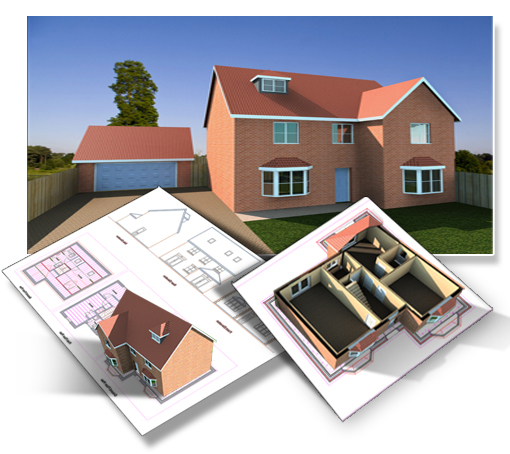 It's fast, straightforward to use and completely tailored for drawing plans for building projects. PlansXpress comes with a fantastic selection of construction drawing tools and architectural symbols that you simply click, drag and drop onto your drawing. Quickly and EASILY draw professional building plans, elevations and 3D models with PlansXpress. 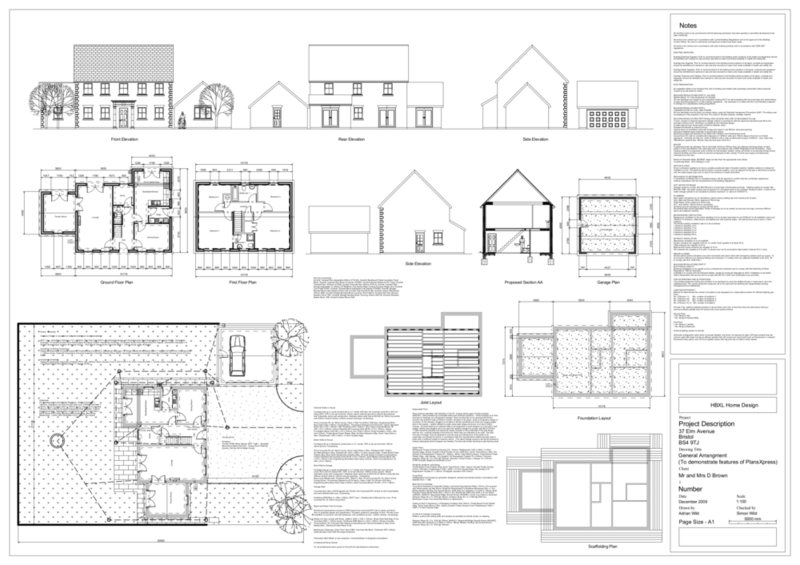 Yes YOU can produce architect quality planning application and building regs compliant drawings! Get ahead of the competition with architect quality plans, elevations and 3D models from PlansXpress. Plus knock the socks off your competitors with photorealistic rendering using the 3D PhotoVisualiser plug-in (optional extra). PlansXpress comes with a library of pre-made drawing tools making it easy to just click, drag & drop everything onto your plans. Drawing a Brick & Block Cavity Wall? Just select it from the menu, click on the drawing and drag to the required length. All the hatching and detail to show the cavity is done for you! 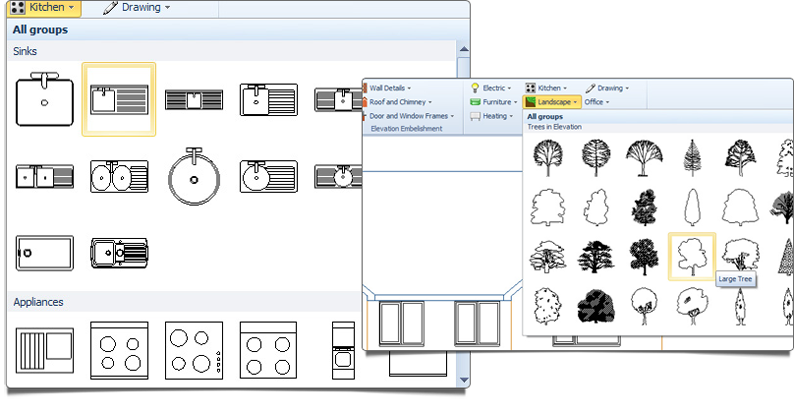 PlansXpress is unique because it comes with a complete set of its own pre-built construction symbols and drawing tools allowing you to just click and place almost any element of a building project onto the drawing without having to resize objects or customise the shapes. Use our easy to use Ribbon which provides you with a large toolbar filled with pictures of the drawing tools you can access which are grouped by different functionality to make drawing quicker! 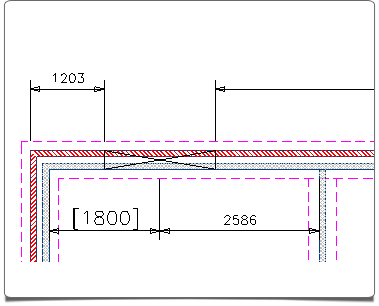 Point at an element on your drawing and then simply click the scroll wheel on your mouse and select 'Add Dimensions' to place accurate dimensions on the plans. You'll be amazed how quickly you can add dimensions to your whole set of designs. 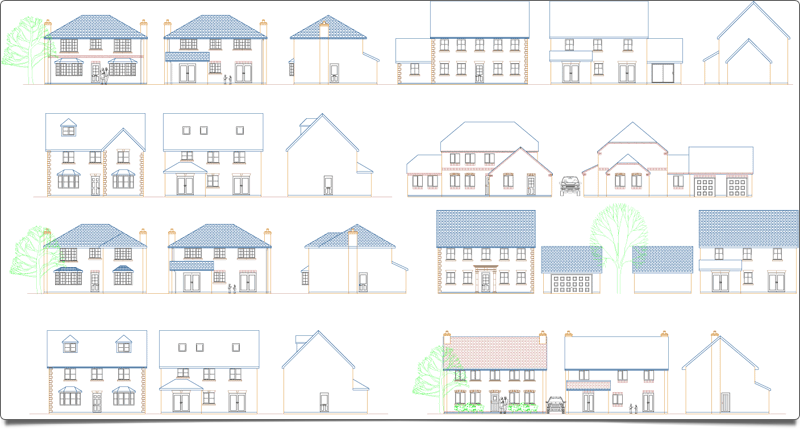 With your plans drawn, PlansXpress will amaze you with the professional 2D elevations it produces without you having to draw a thing! As you draw in 2D, PlansXpress automatically creates a fully textured 3D model on the fly. Great for builders to show off to customers and ideal for evaluating space and analysing your plans. PLUS, with one click using the 3D PhotoVisualiser™ plug-in, you can generate a photo-realistic render of the project and place onto real-life background photographs to transform your building plans into real life 3D. Combine PlansXpress with EstimatorXpress to cost your plans in minutes. If you have existing building plans from your client you can import a scanned image of the plans into PlansXpress (or import a DXF or DWG file from the likes of AutoCAD), then quickly trace over the drawing and export it to EstimatorXpress which will price up the plan in no time. Or start your plans from scratch in PlansXpress then import the drawing into EstimatorXpress and it will price it automatically down to the last screw. The beauty of PlansXpress is that it is so easy to use, even for someone as IT illiterate as me! Use automated tools to fill in selected areas of your elevations with patterns to help differentiate between different parts of your designs. As well as making your plans more impressive, this use of hatching makes it easier to understand the different sections on the plan. Add quoins, piers and other additions and patterns to your elevations using pre-drawn symbols from the library. Add any detailing to your drawing such as full sections and choose some section notes from the library too, or author your own. Simply select from the section library and place on the drawing without having to start from scratch - although of course you can adapt an existing section to meet your specific requirement. To finish off your plans ready for submission to planning applications and building regulations then insert technical notes from the library – even better - with EstimatorXpress it will write these for you! Get ahead of the competition with architect quality plans, elevations and 3D models from PlansXpress. Plus knock the socks off your competitors with photorealistic rendering using the 3D PhotoVisualiser plug-in (optional extra). Research shows that clients often find there is very little to choose from one builder to the next when choosing the right company for their building project. Providing plans and 3D models will set you apart.